Make strips using similar jersey. I wanted a more tailored look so I cut the strips wide enough, folded them in half (right sides together) and flipped them with a loop turner (you can get this at any fabric/craft store). This is more difficult, but looks nicer. You can just cut strips without sewing them. 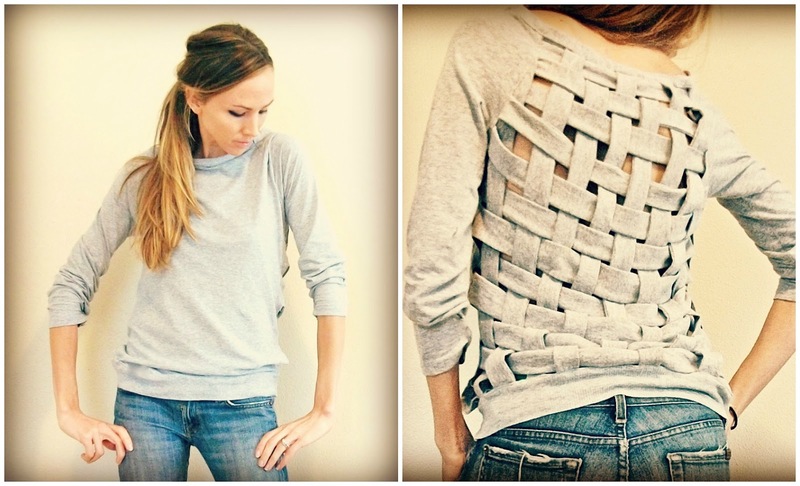 For an easier DIY you can cut the strips right from the back of the shirt. Start horizontally leaving the collar and bottom hem attached. Then weave the extra strips laterally, pinning as you go on the side seam. Weaved them in and out and sew! Once I got to the length I wanted, I made a larger strip to go all the way around. You are freaking brilliant! I LOVE this blog!! Thank you Pinterest! That's going to look so cute! I want one of these! Please tell me you have your own little shop and I can buy it from you. I also want one of those french riviera cardigans too. I love love love your blog and wish I was as talented as you! Do you have a link to your shop? ohmagarsh!!! I love this so very much. And your ENTIRE blog for that matter :) You are so incredibly talented I can't handle it. (Did you go to school for this?) This looks very hard for my mediocre sewing skills (hey. I'm learning!) but I may just be crazy enough to try it.. If you have extra time, it would be so awesome if you made a video tutorial for this one. I would love you even more than I do! Hi everyone thank you! I do plan on selling these at my shop when I get some time. I've been looking all over for this tute! I pinned it, but the pin only went to a pic and not the tute. Anyways, I finally gave up looking for the tute and made a hoodie sweatshirt and weaved the back. I will post about it soon and I'll be sure to link here. I love that you up-cycled yours. All of your diy's are amazing! This is awesome!!! I will definitely have to give this a try. Thanks for sharing! 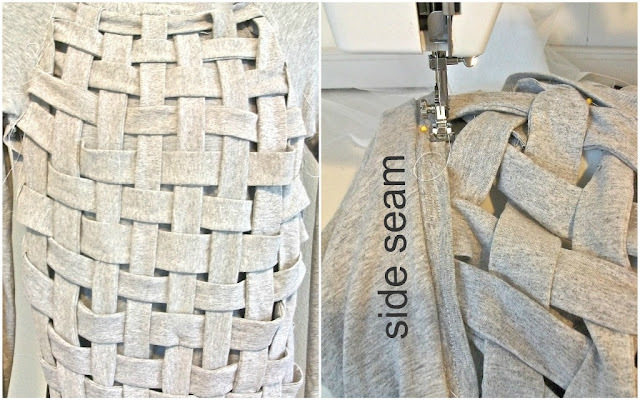 did you use one shirt to make this or did you use scraps from another old shirt as well? She wrote that she used similar jersey fabric, but you can use just the regular shirt as well. It just won't look as nice. Wow, love this idea. It looks amazing! I have a question though. When you make your strips did you fold the fabric strips in half, sew your seam and then turn them inside out for a more finished look?Thnaks again for the great idea! Agreed! I'm using a clearance shirt I got at Delia's (for $6) to make this, but since I didn't get two shirts I am just going to use some pretty fabric so I can do the more tailored look. :) I'm going to post a tutorial on my blog with my version (though of course I'll include a link to here, because this was my inspiration). I love it! Is there any way you can make a how to video? I would buy one def! Any way you sell them? Did you cut out the back of the shirt and did the basket weave? hey I'm also interested in the basket weaved shirt and wanted to know what's the biggest size you offer? You seriously need to be selling these shirts. I'd buy one right now. LOVE IT. I must say that I love your ideas. 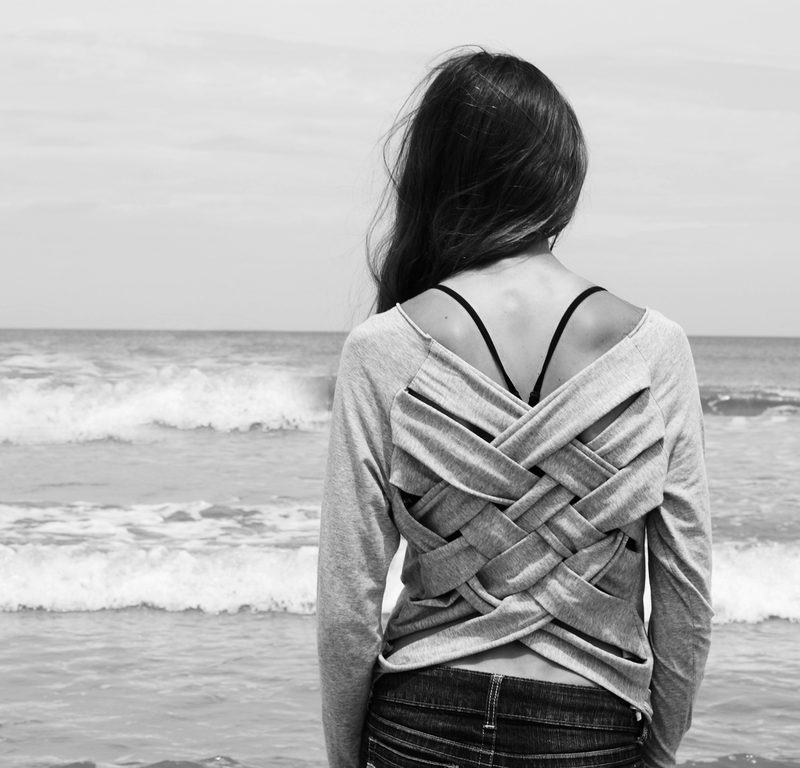 In fact, I have been inspired by you and has created a braided back, just in a different way. I think you should sell them, too!! I'd love to order one from you! where can you get this sweatshirt? were can you get that sweatshirt? Are you selling these or can you tell me where you bought the shirt to make it? I love your blog! Just found it through my sister-in-law who lives in B.C. Random question, but what kind of jeans are these in the pics above? I love them! I REALLY LIKE YOUR BLOG!!!!!! YOUR IDEAS ARE JUST INSANELY GOOD!!!!!!! Your website is full of interesting stuffs to read. I really enjoyed exploring your site. Click here if you want to visit my blog.